Ukraine Boxing Federation has entered a national team: Juniors, full squad. Other confirmed competitors include: Germany, Latvia, Norway, Denmark and Ireland. 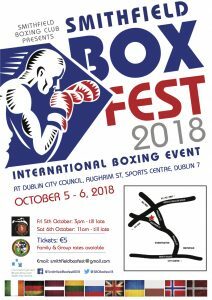 This is an excellent opportunity for your boxers to experience competition in a multi-nations environment against countries with strong boxing traditions. SmithfieldBoxfest is an open class tournament, but it is open to boxers competing at regional and national level. Women: 48kg , 60kg , 75k. Accommodation in the area is booking up, so be sure to secure yours! Smithfield Boxing Club, Aughrim Street Sports Centre, Dublin 7, Ireland. IABA Affiliated 2008.